I arrived at Glacier Cottages late in the afternoon, having spent the entire day cruising down the west coast of New Zealand’s South Island. I stepped out of my rental car and took a deep breath of fresh, crisp air as I digested the spectacular view of the property’s 40 acres and the river that cuts through it, the two-lane road leading into the town, the snow-capped mountains, and the icy terminus of 7.5-mile-long Franz Josef Glacier. I was already regretting that I would be spending only one night here. 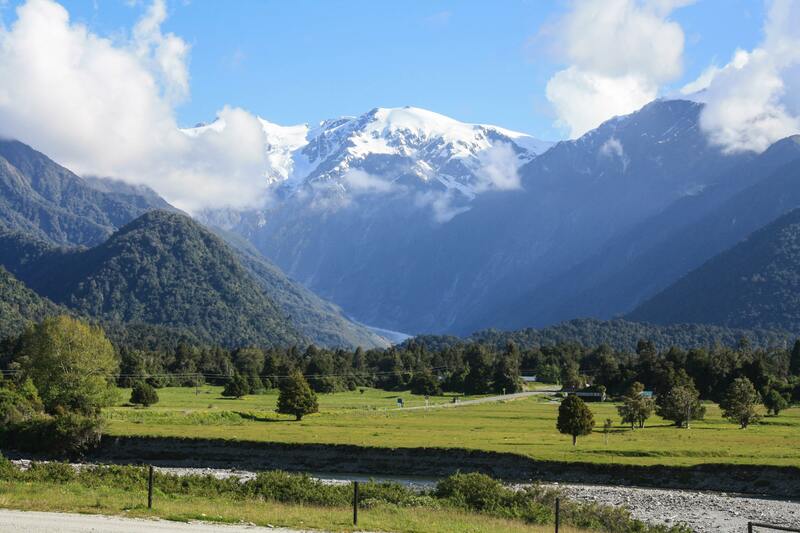 A flawless view of the Southern Alps and Franz Josef Glacier are right outside your door. The fourth-generation owners of this property — a farm of bred and show miniature horses — handed me a complementary bottle of milk upon check-in and directed me to my private cottage, one of three that the owners constructed in 2005. I cracked open the bottle and inspected the cottage — a tremendously spacious accommodation, complete with living room and kitchenette. But Glacier Cottages is all about outside, so after dinner in town, I sat on my porch and enjoyed the view and the sunset that warmed up the tree-covered foothills fronting the rugged, snowy mountains behind them — and the unexpected animal show about to unfold. As soon as I opened a cookie package, a cat ran up to me and started brushing against my legs, back and forth, repeatedly. It was Sabrina, the owners’ friendly feline. She liked me, so we hung out together until a Jack Russell terrier popped out to go bark at nothing in particular, which freaked out the cat. She immediately hid under the porch. Then a horse neighed, spooking the Jack Russell, which bolted back to where it came from, and Sabrina emerged from her hiding spot. This cycle occurred two more times, providing some of the best free entertainment I had seen in quite a while. 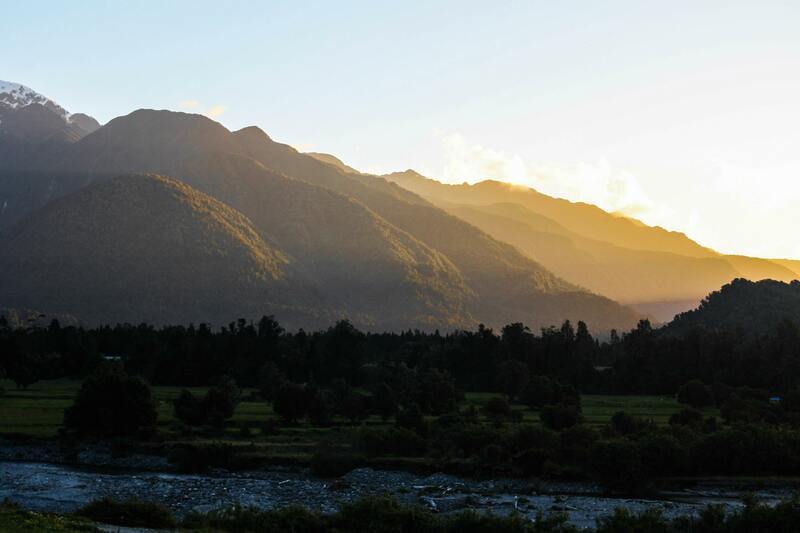 Enjoy a New Zealand sunset from the porch of your private cottage. At around 10 p.m., I stepped away from my cottage and looked up at the sky. For nearly an hour, I had my head thrown back, spellbound by countless stars and unfamiliar constellations, more than I had ever seen in my life, having grown up in New York, where light pollution obliterates all but the brightest stellar bodies. The stars really did seem to twinkle here in the obsidian sky, the boundless universe stretching out to infinity all around me and a smudge of another galaxy here and there. Whether you’re a casual stargazer or serious astronomer, nature lover or horse fan, Glacier Cottages will undoubtedly be to your liking and inevitably land on your list of favorite places you’ve ever stayed.